INVICTA KENT MEDIA: "Bring something big" they said, so Allely's of Studley in Warwickshire duly obliged with Southern Railway Bulleid Merchant Navy Class 4-6-2 'Canadian Pacific' No 35005 from the Watercress Line! 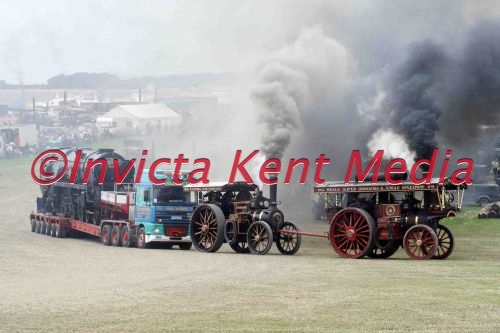 An awesome spectacle at the 2008 Great Dorset Steam Fair Leading the procession is Burrell showman's engine DH2542 which is towing Burrell traction engine DO2067 'The President' behind which is Allely's 2001 150-ton DAF 95-340 8x4 T300AHH & 6-axle low-loader. Leading the procession is Burrell showman's engine DH2542 which is towing Burrell traction engine DO2067 'The President' behind which is Allely's 2001 150-ton DAF 95-340 8x4 T300AHH & 6-axle low-loader.